The noise machines are getting louder these days with Junk Bond Funds falling to levels not seen since March. You have the frustrated stock market bears data mining the heck out of everything trying to find something to justify their losing positions, or lack of winning ones in many cases. Remember it’s not just about the money they’ve lost trying to short the stock market, it’s the overwhelming amount of opportunity cost already incurred by simply not being long enough. It’s double the frustration. I’ve noticed these bears turning to the bond market for guidance. Intermarket Day is one of my favorite days. Yes I’m a huge nerd. Deal with it! This is when I go through many markets relative to each other. These markets include individual U.S. Sectors compared with the overall U.S. Stock market. We also look at other assets against each other like Bonds, Commodities and Currencies. We price Gold in other currencies, and change around denominators for both trade idea generation and also for informational purposes. Chart Of The Week: Buy High Yield Bonds! With all of the bad news and negative sentiment surrounding the high yield bond market, I think this is a place where we want to be buyers, and no longer sellers. High yield bonds are just a fancy way to refer to “Junk bonds”. At the end of the day, high yield is just that: high yield, because you’re getting paid a higher return for the risk you’re taking by owning junk. Both on their own and relative to the safe-haven U.S. Treasury Bonds, these things have been destroyed over the last few years. On Wednesday I was over at the Fox Business studios chatting with David Asman and Liz Claman about the US Stock Market. As you guys know I’ve been pretty bearish since the summer. The brief new highs in the S&P500 and Dow Jones Industrial Average last month didn’t tell the whole story. Very few stocks made new highs and most of the averages had already been rolling over. In this segment we went over a few of the indicators that had made us bearish and what’s happened since then to make me think stocks are heading even lower. The bond market has been warning us all year to be skeptical of these new highs in the large-cap stock market indexes. The majority of publicly traded stocks are down year-to-date. But you won’t read that in the headlines. In fact, the small-caps are down 9% year-to-date and micro-caps are down over 10% this year. Mid-cap stocks are down this year, the NYSE Composite is down this year and the Dow Jones Industrial Average has done nothing. The S&P500 is barely up, and the Nasdaq100 being held up by a few names is doing the best so far. But what is the bond market telling us? 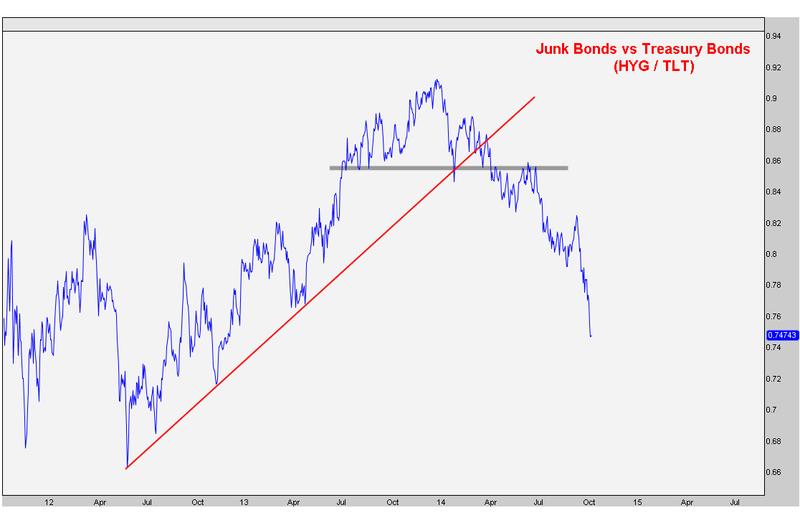 Today we’re taking a look at the Junk Bond vs Treasury Bond ratio. This is a similar concept to Discretionary vs Staples ratio we just looked at. If there is real risk appetite out there, managers would rather speculate in High Yield Junk Bonds than put money into US Treasury Bonds. One of them is speculative and the other one is theoretically the safest place in the world. When this ratio is rising, managers are more willing to put risk on. When this ratio is declining, managers are looking for a safe haven, for whatever the reason. We want to see this ratio hitting new highs, not new lows. The bond market historically is said to be smarter than the stock market. Maybe that’s true and maybe it isn’t. Maybe they’re coincident indicators. But regardless, all year this ratio has been diverging vs the Large-cap averages. It appears that the few stocks that have actually gone up this year are now catching on to the lack of risk-appetite out there. I’d be watching $AAPL as it is one of the few mega-cap leaders that are still near highs and have yet to correct (see here) . If this breaks down, as the bond market is suggesting, this is going to cause an even bigger problem for the market overall. On Monday, Liz, David and I discussed the S&p500 while looking at both structural and shorter-term trends. I’m not sure where the bear market headline came from because I think it’s a bit too early to call for such a correction. But I do think the stock market continues to struggle through the third quarter, at least from where we sit today. The 4th chart is a composite of 3 cycles where we combine the 1-year seasonal trends, the 4-year Presidential Cycle and Decennial Pattern. Our composite also suggests a tough market through Q3 but points to a very positive fourth quarter.